Graduating from high school is a time of excitement and adventure for many young people, but also a time filled with uncertainty. In addition, the end of high school means transitions to college, into jobs, into the military, or out of the foster care system. All of these situations bring up things to think about regarding general well-being, health concerns and diagnoses, and medications. Your child’s pediatrician can be a wonderful source of advice on helping your teen to transition successfull​y. Is your child headed to c​ollege? Know what to do to support your teen emotionally as he ventures out into the world and away from home base. 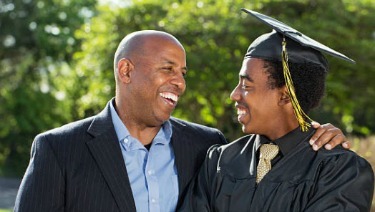 ​​Make sure that your teen has medical coverage after high school and teach your teen how to access and use it. Many teens and young adults are covered under their parents’ health insurance through age 25. If your teen has mental health needs, develop a plan of care in advance of your teen moving away from home. For college, this can take several weeks or months to develop. Does your child have a mental health diagnosis, such as A​DHD, depression, eating diso​rder, etc? Be sure to ask the health center staff what kind of medical information they will need related to your teen, and how to set up prescription refills if needed. Do you have a child in foster care who is “graduating” out of the system? Depending on state laws, children in foster care are covered under Medicaid until age 18 or 21 and may need to transition to a different provider. Some may need to transition even earlier to an adult or Transitional Aged Youth mental health provider. Young adults transitioning out of the foster care system need help in identifying caring adults—related or not—​from whom they can seek advice, support, and reassurance. See Health Insurance for Young Adults Previously in Foster Care for more information. Alcohol, drugs and sexual activity may become more accessible at this time. Be clear about your expectations regarding drug and alcohol use are even though your child may not be living at home. Be sure your teen knows where to go—whether on campus or locally—for reproductive health care. Continue to have conversations about peer pressure, good decisions, and consequences. Graduating from high school is such an exciting time. For some, this may mean transitioning to a full time job. For others, it may mean heading off to college. Whatever this next stage in life brings, it’s important to be in charge of your own health. Here are some tips for you to consider. Participate in activities to promote your overall health. Eating right, getting enough sleep (at least 8-10 hours), and being active will keep you feeling energized and can reduce stress. If you have a health care problem, know the facts. When going to a new doctor or clinic, you will need to provide information about your diagnosis and how you treat it. If you are taking medication to treat a health care problem, know the name of the medication, how is it taken, side effects, and if you cannot have certain foods or drinks while taking the medication. Also know how and where you will go to refill prescriptions. If you have a chronic health condition, make sure roommates or someone close to you know about your health condition, signs of problems, and what to do in an emergency situation. Consider having your treating physician send a report with your current status and treatment report to the Health Center. If your problem is particularly complex or challenging, consider talking with or meeting with a health center staff member before the academic year starts.